That's not what they were called, as far as I can remember, just made for a half-reasonable post-title! These are unusual in being branded to Hawkin's Bazaar rather than the more commonly used moniker of the parent; Tobar, and being from the storage lot must be over 7 years old, actually titled 13109 PBF Parachute Soldier. The five-figure stock code matching Tobar's current codeing, as does the manufacturer code (038728) but while the postcode given is Norwich, it’s different to the current Tobar postcode, however; there was a solvency problem with Hawkin's a few years ago reported here at the time and it'll all be connected to that. 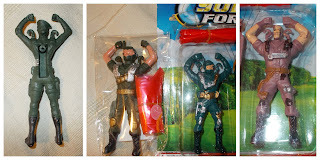 They are 95mm and made from that odd sort of recycled plastic which is best described as 'sandy' textured, and I must have grabbed all four poses when I saw them, however . . .
. . . they are 'similar' versions of the more recent, slightly smaller (80-mil-odd) Soldier Force figures from Hunson, sent to the blog in the last year or two by Brian Berke. 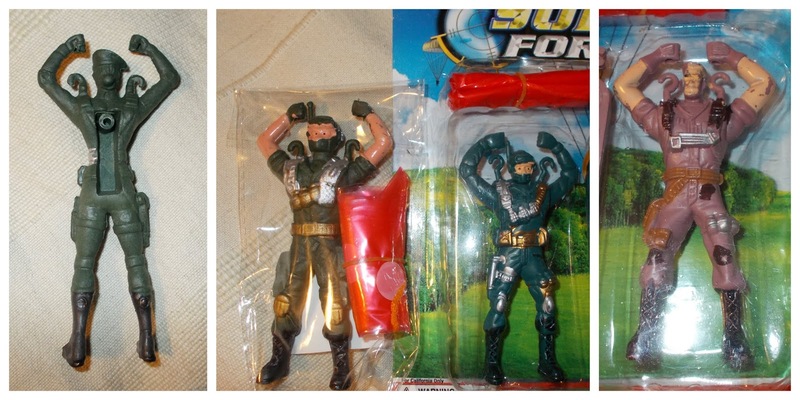 While all the details are not the same, the painting style and plastic type is the same and it may well be they are all from the same contract manufacturer, and that I missed-out on a larger version of the 'Max Headroom' character (or is it Chip Hazard from Small Soldiers?) on the right?